Fiber reinforced polymer (FRP) rebar are composite materials and a noncorrosive and nonconductive alternative to steel for the reinforcement of structural concrete members. FRP and steel rebar have differences in physical and mechanical properties that engineers should understand when designing with FRP rebar. FRP reinforcing bars are manufactured using a variety of fibers in a polymer matrix. Glass fiber is the most popular; however, basalt, carbon, aramid, PBO and other fibers are also used in FRP bars. The matrix is a thermoset compound and is usually epoxy or vinyl ester although other polymer matrices are used. Unlike steel rebar that is manufactured to uniform standards, each manufacturer’s FRP reinforcing bars will have unique physical and strength characteristics. A manufacturer’s FRP bar product data sheet that identifies these characteristics is required for the calculation of strength and serviceability criteria for FRP reinforced concrete members. Design loads on a reinforced concrete structure are determined using the same methods whether reinforced using steel or using high strength, fiber reinforced polymer (FRP) reinforcing bars. Steel and FRP reinforced concrete members are analyzed using similar methods to meet the following strength and serviceability criteria: Factored moment, factored shear, crack width, and long-term deflection. Additionally, FRP reinforced members are analyzed for creep-rupture stress in FRP bars where steel reinforced members are not. For most members, the design of FRP reinforced sections is driven primarily by serviceability requirements: crack width and long-term deflection. This is due to the generally lower modulus of elasticity of FRP bars as compared to steel bars. When these criteria are met, flexural strength (?Mn), minimum reinforcement (Af), and creep-rupture stress are generally easily met. The flexural strength of a section using ACI 440.1 is calculated similarly to ACI 318, “Building Code Requirements for Structural Concrete and Commentary.” Because FRP rebars do not yield like steel bars, FRP reinforced members are generally over-reinforced (that is, the ratio of FRP reinforcement to concrete is greater than the balanced ratio) so that concrete crushing of the member controls the failure mode. A FRP reinforced section that is under-reinforced (that is, the ratio of FRP reinforcement to concrete is less than the balanced ratio) may result in a failure mode of FRP rupture, which is not a preferred ductile failure mode. Because of the relative lack of ductility in FRP reinforced failure modes, the flexural strength reduction factor ranges between 0.55 and 0.65, based on the ratio of proposed reinforcement to the balanced reinforcement ratio. For failure by FRP rupture, the strength reduction factor is 0.55. Where failure is by concrete crushing, the strength reduction factor increases to 0.65 where the ratio of proposed FRP reinforcing is greater than 1.4 times the balanced reinforcement ratio. 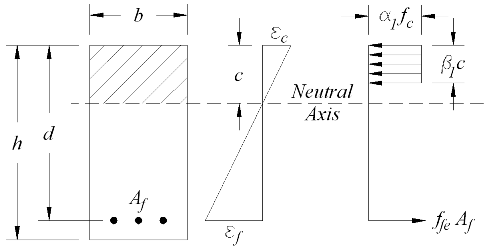 Shear strength design is based on familiar ACI 318 methods. ACI 440.1, however, does not allow for dowel action of FRP rebar to resist shear, as ACI 318 allows steel bars to resist shear. To resist shear forces a FRP reinforced member must contain ties or stirrups to resist shear, or if not practical as in the case of reinforced concrete tanks, rely only on the shear resistance of concrete. A RC design without shear reinforcing leads to deeper sections where shear is critical. Although a deeper member may not initially be desired, a deep member corresponds to an increase of the cracking moment of the section. A cracking moment that is 25 percent greater than the applied service moment allows the gross moment of inertia to be used to calculate deflections and the full section of the concrete member to resist shear loads. The tensile strengths of FRP rebar can be much greater than that of steel, most FRP bars have a much lower modulus of elasticity, or stiffness. Decreased stiffness means that more reinforcing is needed to mitigate long-term deflections and limit crack widths or a deeper member may be needed. Crack width calculations are based on the same concept for FRP rebar as it is for steel reinforced members , except that it is modified by a bond quality coefficient, kb. The bond of FRP bars to concrete is generally less than that of steel bars due to less prominent deformations, which according to ACI 440.1 has a long-term affect on crack widths. ACI 440.1 recommends that the crack width calculation be increased by the bond quality coefficient of kb equal to 1.4, unless a FRP bar manufacturer can prove by testing that its bond with concrete results in a lower bond quality coefficient. Long-term deflection calculations are based on ACI 318 section 9.5, direct method of limiting computed deflections. Where the applied, unfactored moment exceeds the cracking moment, the effective moment of inertia is reduced by the reduced tension stiffening in FRP reinforced sections as compared to steel reinforced sections. The degree of tension stiffening in FRP reinforced sections decreases with the amount of reinforcing compared to the balanced reinforcing ratio. 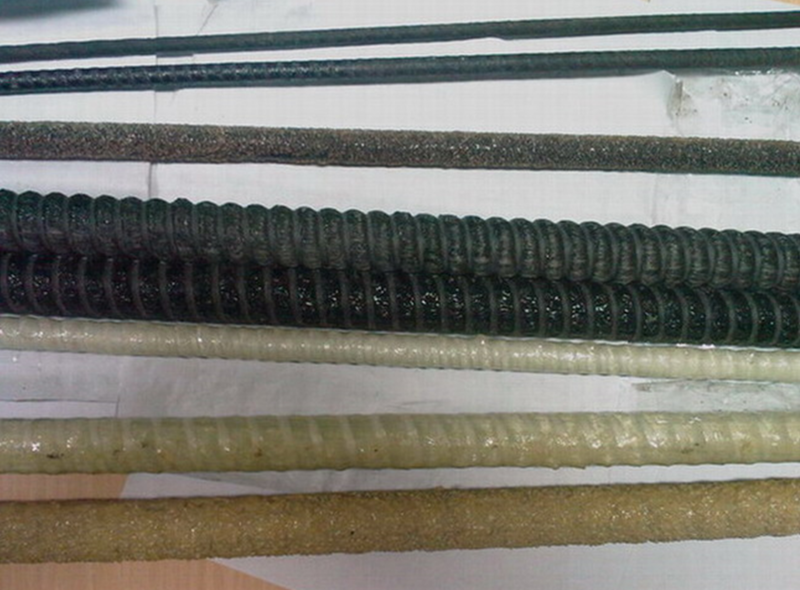 Creep-rupture and fatigue effects on a FRP reinforced concrete member limit the amount of stress allowed on FRP rebar. ACI 440.1 provides creep-rupture strength reduction coefficients for carbon, glass, and aramid FRP bars. Click to see this chart for each of the factors. Although ACI 440.1 does not recommend a creep-rupture stress limit for basalt FRPs, research by Dr. Anil Patnaik at the University of Akron recommends a maximum creep-rupture stress limit on basalt FRPs to 0.15 times the environmentally factored, ultimate tensile strength, ffu. Send Prince Engineering, PLC a message with questions or comments on this topic (This link takes you to the email contact form) or simply call. We’re inclusive, not exclusive. That means engineering is discussed in a way that’s easy, understandable and productive. You’ll enjoy what you can build with Prince.